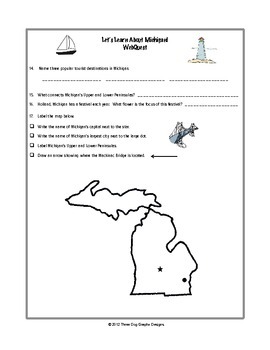 This Michigan webquest informational reading research activity is a great way to introduce important information in about the state. 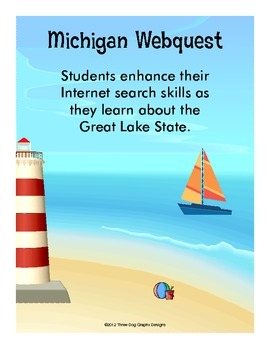 Students will learn many interesting facts about Michigan as they use Internet search skills to find information. This webquest is two pages in length. A full answer key is included. This is a great activity to use for fast finishers, or as part of an informational reading lesson or social studies curriculum. "My 3rd graders adored this. We did the for Fun Friday with the Chromebooks last week! Little did they know it was a Social Studies lesson. They thought it was fun!" "Fun way to introduce Michigan history." "The students enjoyed this activity!" 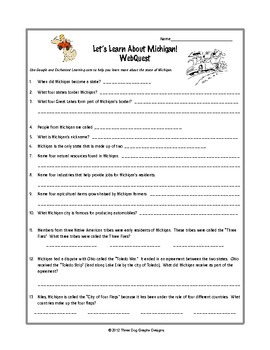 Check out my Wacky Michigan Facts - Informational Reading Webquest Activity! Promote positive character in a fun way! Check out my camping themed character unit at Camp Classy Character unit which is 96 pages in length, and includes many camping themed activities and behavior management forms.